November 14, 2014 By This post may contain affiliate links. Learn how to make Ear of Corn Piñata Cookies for this Cinco de Mayo. 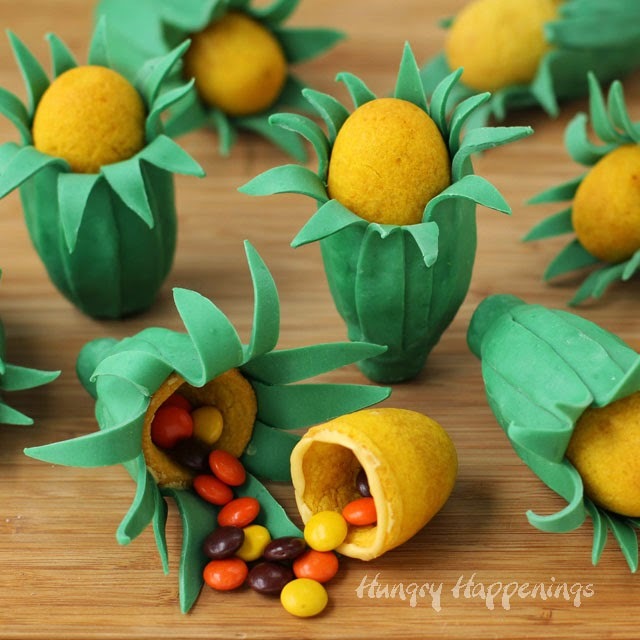 Stuff your favorite candies into the hollow centers and watch them burst like piñatas. I was really excited when I came up with the concept to make 3-D corn shaped cookies filled with candy, worked for two days to get them right, made three batches of cookies, and finally felt I had something that resembled corn. That was until my husband came into the kitchen and said they looked like eggs wrapped in leaves or odd looking sunflowers. UHG! I tried adding individual kernels to the corn, but that really didn’t help, and it was so much more work that in the end I decided to skip it. 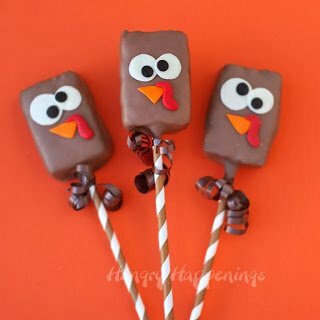 The candy filled cookies are still fun, even if they don’t exactly resemble ears of corn and I’m happy to have something to share with you today. On Wednesday I worked from 8 a.m. until 1:00 a.m. the next morning trying to get a surprise inside cake completed for Tablespoon.com. The whole day was a train wreck. My kitchen was the biggest mess I’d ever seen. My angel of a mother came over to help me clean it the next morning and it took both of us working for almost 2 hours and I still had to finish the cake, which meant more mess. I did finally get the cake to work and it looks really good, so my emotions went back up.Then I got an e-mail, that brought me back down. I was hoping to announce to you this week that a video that I was asked to film for the Rachel Ray Show was going to air soon, but found out that it wont air at all until possibly next Thanksgiving. Their schedule is too full. Big bummer. All of these things were nothing compared to the emotional roller coaster I was on trying to get tickets to The Food Blog Forum, which is a blog conference at Disney World. Thousands of bloggers were competing for 100 tickets because for $350 a family of four could stay in the Grand Floridian Hotel for three nights, have park hopper passes for the Disney parks, and one pass to the conference. One night in the Grand Floridian costs $600. So, this was a crazy good deal. They sold tickets in three batches, the first day, I didn’t get one, I was so sad. My husband and I had spent hours planning our trip and we were both really looking forward to it. When tickets went on sale the second day, I had three people trying to get tickets. Nope, nothing. Sad again. So, yesterday about 5 minutes before they went on sale for the third and final time, I took a few deep breaths, and manned my computer. When I clicked to buy a ticket, and I got through, my hands were trembling so badly. I needed to type in my information quickly knowing the ticket could vanish if I didn’t work fast enough. I kept getting error messages, and was losing hope. When the screen popped up and said my order was complete, my heart was pounding. I burst into happy tears. I feel like Charlie Bucket, getting a golden ticket and the best part is, I’ll be in Disney World with my blogger friend, Jill and Winnie the Pooh on my 50th birthday. It’s a good thing I like roller coasters, but have to admit this one I was on this week, made me way too queasy. I think I’ll head over to the Peter Pan ride. It’s much more calm. Mix the flour, salt, and baking powder together in a bowl. Set aside. Cream butter and sugar until light and fluffy. Stir in egg, vanilla, almond extract, and some drops of yellow food coloring. Add more coloring until you get a really bright shade of yellow and mix until well combined. The color will get lighter when you add the dry ingredients. Add dry ingredients and stir just until it’s mixed in. 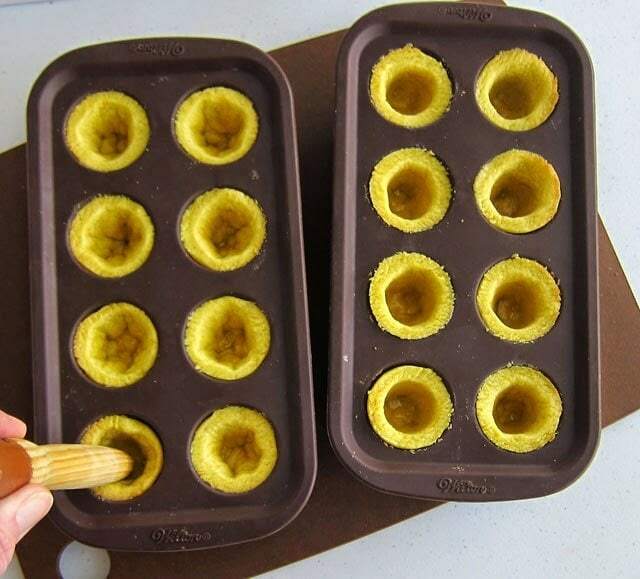 Pinch off heaping tablespoon sized pieces of dough and press into the cavities of a Wilton Brownie Pop Mold. Use your finger or the tip of a wooden spoon to create a well in each dough ball. Press the dough into a 1/4 inch thick shell inside each mold. Cut off any dough that comes out over the top of the molds. Pop the molds in the refrigerator for at least 1 hour. Bake cookies for 14 minutes. Remove and use the end of a wooden spoon to reform the shells, pressing the dough that has puffed back into a thin layer. 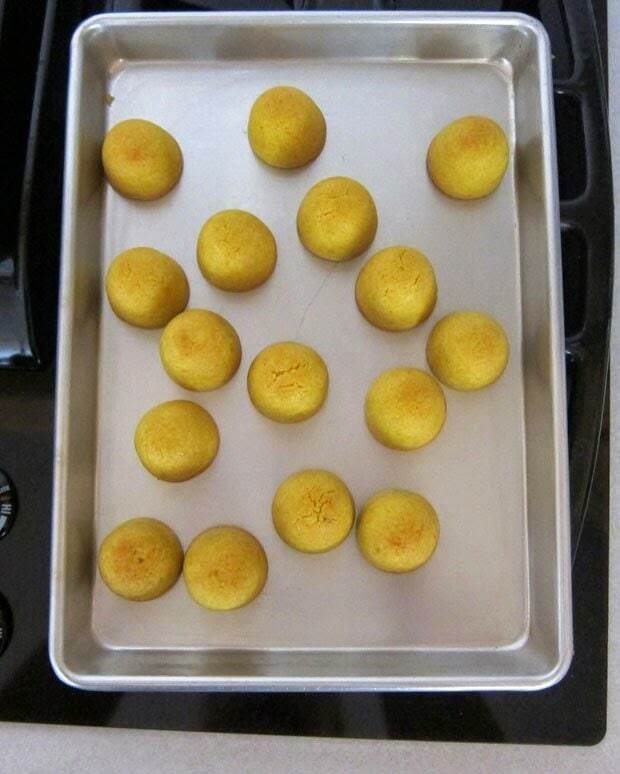 Put the cookies back in the oven for 6 minutes then remove them and carefully turn them over allowing the cookies to come out on a baking sheet. Set them all with the rounded tips up then put them back in the oven for 4-8 minutes, until the tops start to turn golden brown. You just want to make sure the cookies are baked through. Use a sharp knife to smooth out the top edge of each cookie. 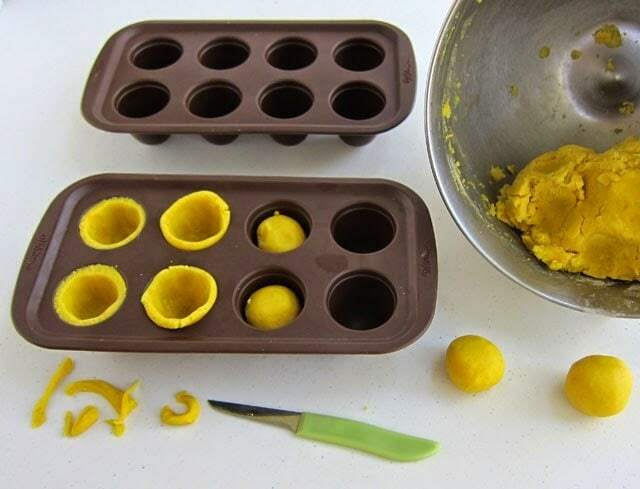 You want each egg shaped cookie to be smooth.Set 8 cookies in the silicone mold. Fill those cookies with candies. 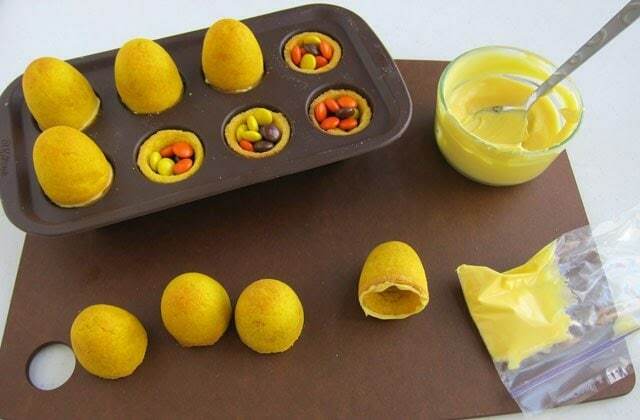 Melt the yellow confectionery coating, by heating it at 20 second intervals on high power in the microwave, stirring after each, until melted. 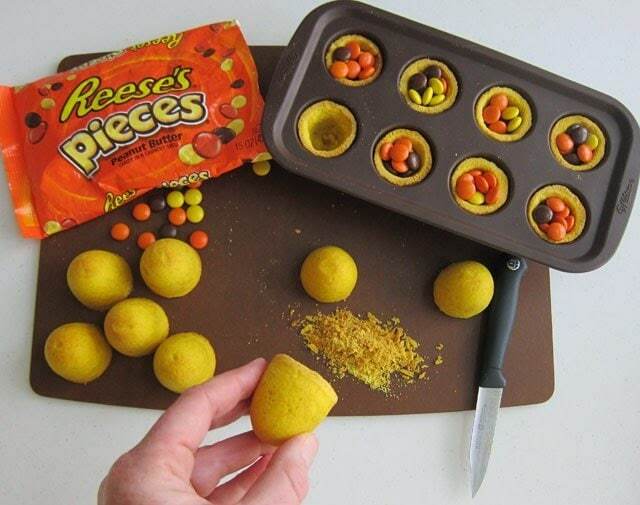 Pour the candy coating into a pastry bag, zip top bag, or squeeze bottle. Pipe some candy coating around the top edge of a cookie and set it on top of a candy filled cookie, forming the ear of corn. Repeat. Allow the candy coating to dry for 10 minutes. 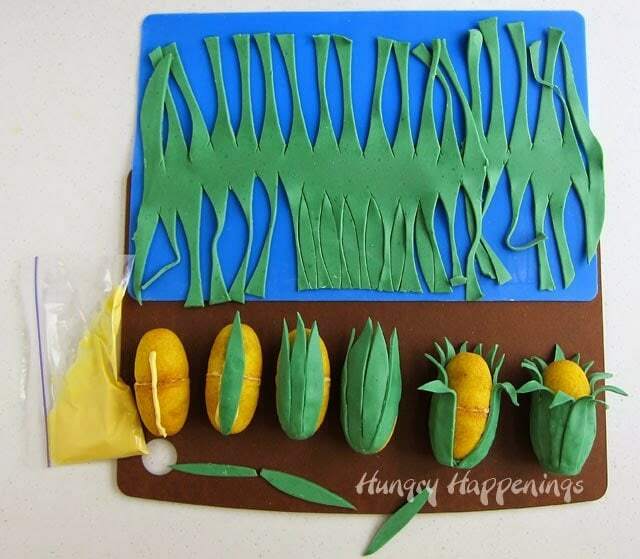 Roll out the green modeling chocolate to about 1/16th of an inch, preferably on a non-stick silicone mat, or on a corn starch dusted cutting board. Cut into long leaf shapes. They need to be long enough to cover the ears of corn, plus hang over a bit. Pipe a line of yellow candy coating onto a cookie, press one green husk on top. 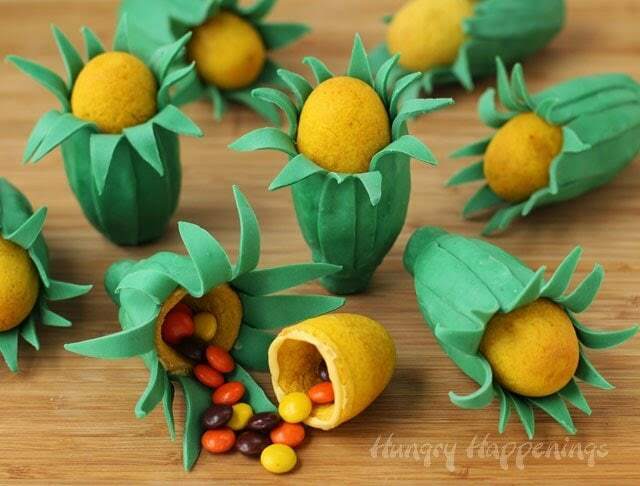 Continue to pipe on yellow candy coating, attaching leaves as you move your way around the corn cookie. In the back. 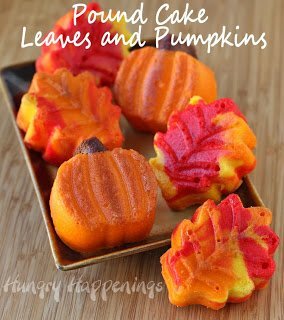 allow the leaves to stick all the way up to the top of the cookie. In the front, they should just come up over the seam in the cookie. Bend the husks to look like they are being peeled from the ear of corn. You can add a stem if you’d like. I think they look more realistic with stems. I am over the moon happy about going to the conference at Disney and feel really blessed to have snagged a ticket, I just wish you were joining Jill and I for our magical trip. Ooh my Beth, I want to hug you now, now that is one hell of a week. I'm sorry abour RR, I hope they air it next year. I'm glad you got the tickets and now you'll be able to have some fun, outside of the kitchen. These are so darling, doesn't matter what you see in them they are awesome and I love anything with surprise. Thank you for all your hard work Beth and Beth's mom for helping out with the clean up. What a sweet mom. Thanks for the hug, Hani:) It's amazing how such a bad week can turn out so amazing. It just goes to show that life can change in the blink of an eye. I am so looking forward to my trip. I am truly blessed to have such a wonderfully helpful mom. She could hear the stress in my voice and offered to come help clean. Aside from getting the tickets, it was the best part of my week. Have a great weekend. LOL! You always make me laugh, Lisa. You should drive over and meet us at Disney anyway. It would be so fun to meet you. O.K. not yet. Not yet. I still have a few more months. I can't even believe I'm going to turn 50 soon. Yeah, my husband looks at everything in such a literal way. It's hard for him to remember, it's just a cookie! I am so excited to have gotten tickets to the conference and am so glad I didn't give up. This post requires a long comment! 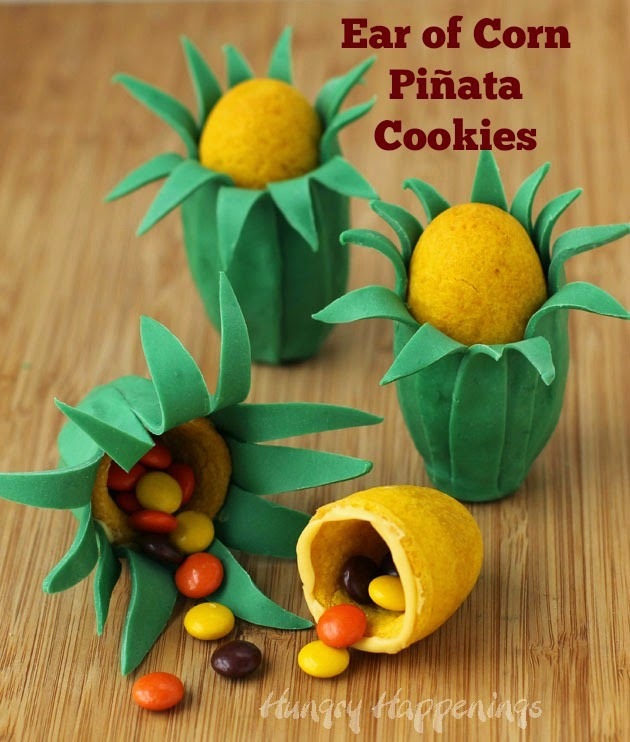 First, the corn pinata cookies are way cute! And what a sweet Mom to come and help you clean the kitchen. :o) I can sorta relate to how you must have felt while making that cake..it used to take me two and three days to decorate one as I wanted it to be absolutely perfect. Haha, the stress got to me and now I no longer make cakes. I can't wait to see yours, they're ALWAYS perfect. How beyond exciting to be asked by the Rachael Ray show to film a video! Even if you have to wait till next year for it to air! 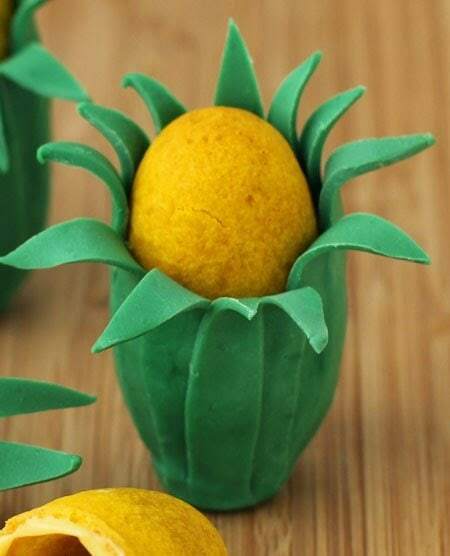 The fact that they've seen your edible crafts pretty much guarantees this will not be only time they'll ask you! As for the Food Blogger Forum..hip, hip hooray! When I saw your FB post, I googled it. I'm waitlisted for this year, but I hope to see you and lots of others next year. Oh, the cake was such a mess, but after three attempts, I finally got something that looked nice. I really don't enjoy making cakes because I don't feel like I know what I'm doing half the time. I usually spend two days working on them too. It's so much work and so much time. I have a lot of respect for cake decorators. I just heard from the Rachel Ray show this afternoon and they are going to try to squeeze it in around Christmas. 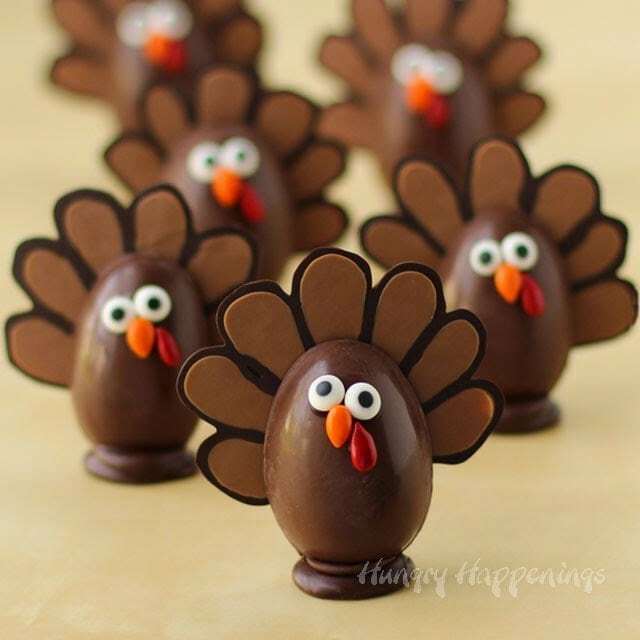 I would love for that to happen, even though it's a Thanksgiving recipe. I still have to pinch myself when I think about getting a coveted spot at the Food Blog Forum. I'm beyond excited and I'll be sure to take lots of pictures to share here. I do hope we get to meet someday. I'm thinking about hosting a retreat for fun food bloggers. I need to start working on plans, but I'm just too busy. Maybe some day! They look great! 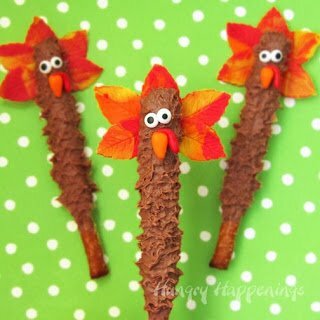 I showed my son a picture without the title and he said right away they looked like corn. Yay! I'm so happy to hear that. I thought they did too. I think my husband just looks at things very literally. I need to remember that next time and be confident in my design. Beth these are so cute. 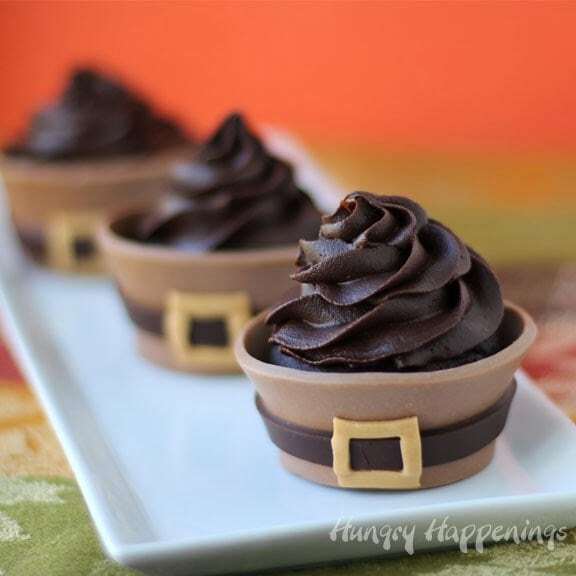 Great for Thanksgiving. Thanks. Trish P.S. The brains were a big hit at my daughters work. Thanks again. Thanks Trish. I'm so glad the Cake Ball Brains were a bit hit again for you. That's always nice to hear. These are so cute, I love them! I don't think it matters that they don't like exactly like ears of corn, they're cookies afterall! Besides, what do mean know anyway? 😉 Pinning and sharing these for sure, they're awesome! It's so nice to hear so many people do think they look like ears of corn. I shared all your comments with my husband and he just shrugged. What does he know? That's so sweet, Michelle. Thanks. These looks fabulous!! Honestly, I am so envious because they look amazing! I know I don't have patience to make anything like this. Perfect for the holidays! Thank you for linking up with #FoodieFridays. These look great! 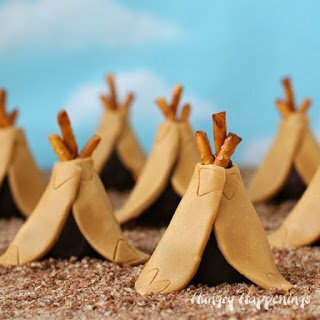 I love all the different ways you’re finding to fill cookies and cakes with surprises! If I could be so bold as to make a suggestion for these cookies….. Try turning your pan over and baking the dough on the outside of the shapes. You would then be able to mark the dough with the back of a knife before baking so that it looks like corn kernels. Also, the inside of the cookie is a lot more spacious for all those little treats! I’ve tried this upside-down baking before and it works great. It wouldn’t matter if not every one was perfect, because you cold used the less pretty ones inside the ‘leaves’. Wilton just came out with a metal pan just like this silicone mold which would work great using your suggestion. When I make my candy filled cookies using my metal cake ball pan, I do put the dough on the outside and it works great. Adding the “corn” is a fun idea! I’ll have to give that a try.